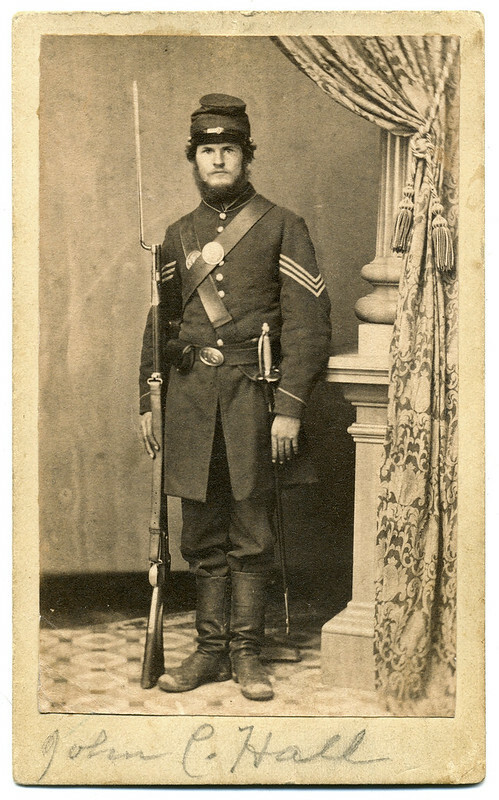 Samuel A. McCulley (also spelled McCauley) numbered among the thousands of Pennsylvanians who rallied to defend the homeland after Gen. Robert E. Lee and his Army of Northern Virginia invaded in June 1863. McCulley served a 60-day term of enlistment as a sergeant with Company A of the Fifty-first Pennsylvania Militia Infantry. The regiment was organized at Philadelphia on July 3, 1863—the last day of the Battle of Gettysburg. It mustered out on September 2, 1863. This carte de visite is new to my collection. The condition and content is excellent. 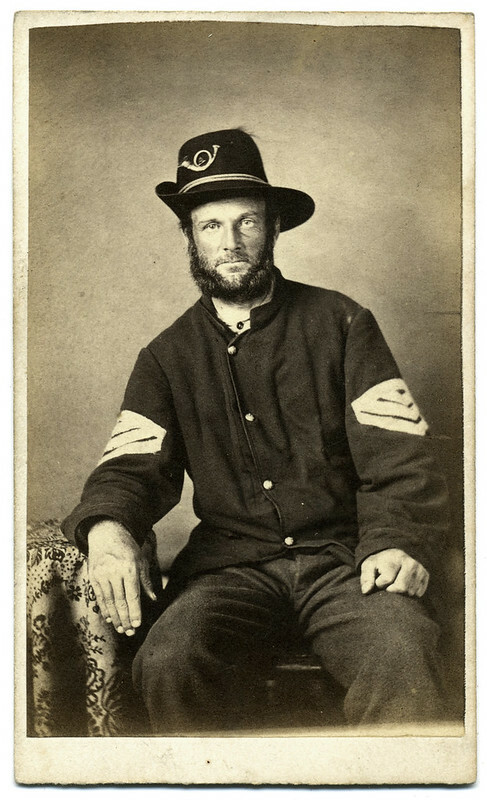 Clearly visible is the infantry horn insignia pinned to his hat, and the bright brass “A” in the middle. The tip of the plume attached to his hat can just be seen. The edge of his jacket where the buttons attached seems to be double-stitched, perhaps to insure that it holds up under the rigors of campaign. 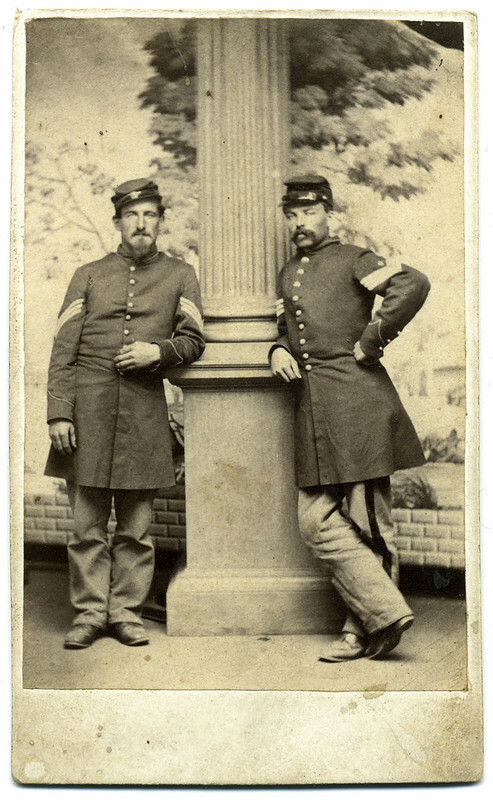 New to the collection is this carte de visite of two Union comrades flanking a column. Both men wear the chevrons of a sergeant on their uniform; the soldier on the right has a diamond at the inner angle of the chevron, which indicates that he is a first sergeant. 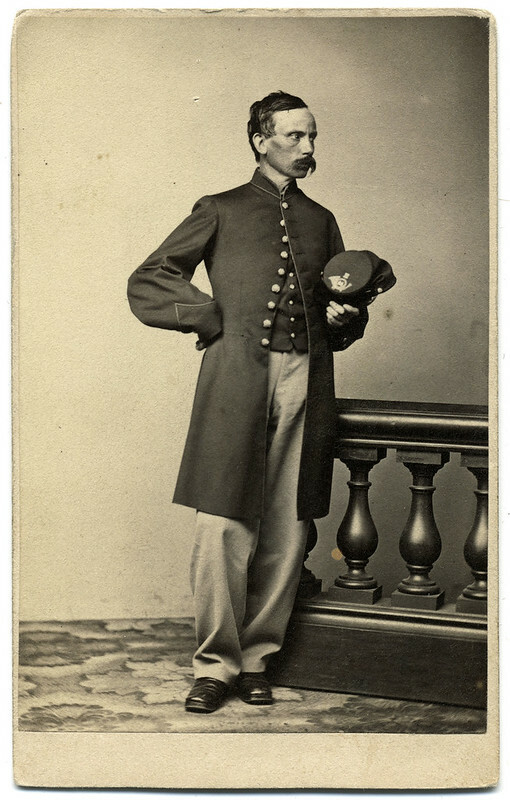 Selected by the company captain, a first sergeant was the ranking non-commissioned officer in a Civil War company. It is his job to receive orders from the captain and be sure they are carried out. 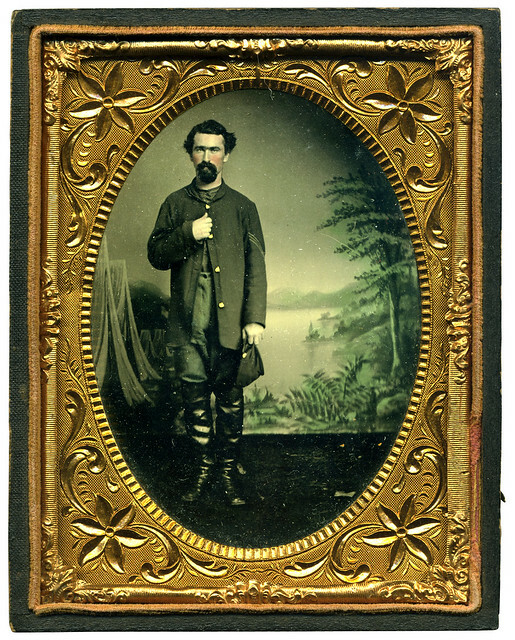 My latest acquisition is this quarter plate tintype of a bearded federal sergeant. He wears a four button campaign jacket over a dark shirt with no collar and knee-high boots as he stands in front of an elaborate backdrop. Holding a forage cap in his left hand, he grasps the edge of his jacket with the other. He stands off center in the frame of this image, leaving the viewer with the impression that it may have been intentional. The empty space to his left may represent a missed loved one or friend, or a fallen comrade. The space may also have been the work of the photographer, who may have artfully posed the sergeant between the tents and foliage pictured in the backdrop. 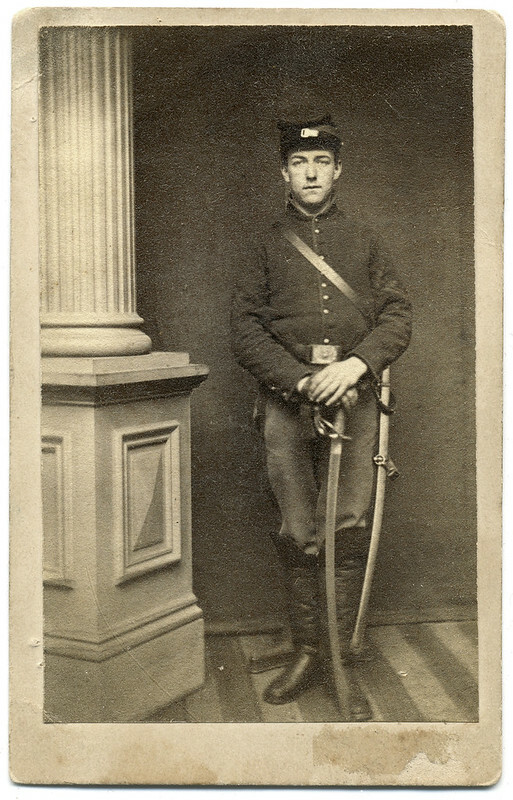 Or perhaps this soldier first posed with another individual before having this image made of only himself, and the photographer failed to adjust the camera or the soldier.